Are we there yet? Well, we are if we make our way from either side of the Gorge to Beacon Rock (those sides, btw, are Portlandish on the west or The Dalles on the east — and, really, those are your only choices unless you’ve got something with 4-wheel drive and a breather. Oh, you do, do you? Well la-di-da. Use yer fancy smart watch to find Beacon Rock, then. I guess you’re all set if any of the volcanoes blow, too, like Pierce Brosnan is in the exploding-volcano documentary Dante’s Peak). 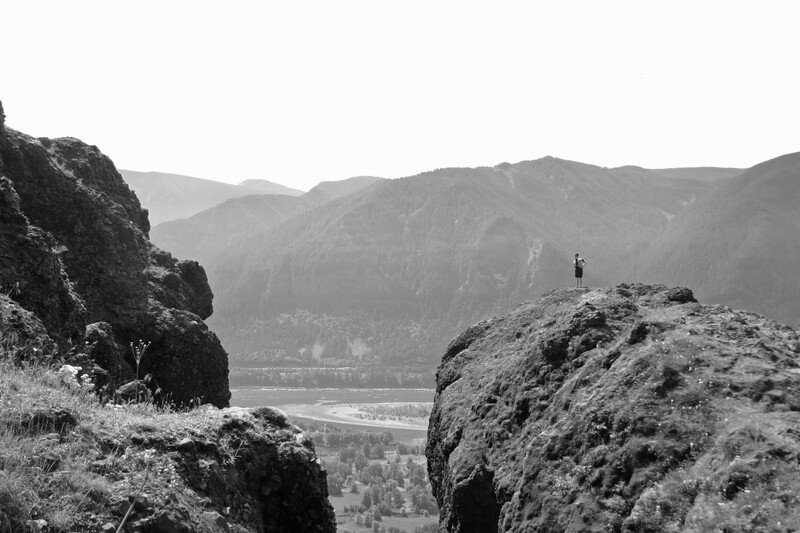 Right, so now you’re at Beacon Rock. Better stop in at the Ranger Station and get a Discovery Pass. That’ll set you back $10 for the day or $30 for the year. Get the year, since you’re going to be traveling with us. By the way, the Northwest Pass won’t work at Beacon or Hamilton. I thought it did. I was incorrect. Don’t make my mistake. Also, don’t climb Beacon. That’s for another episode of Two Sticks and a Corkscrew. Also, you’ll need more beer. Instead, go north up the marked road and find a parking spot. Good luck, because Hamilton is a popular hike with the Portlandia crowd. Anwyay, after you’ve Thunderdomed for a parking place, finding the trail is easy-peasey enough. It’s paved; but don’t let that get you down (I’m looking at you, hiker-handle Big Brother — I know how you feel about paved trails. This one will go away soon enough. Bear with. Well, the bear might not go away, but you know what I’m getting at here). The paved trail takes you up to Hardy Falls. There’s a scenic overlook to the right of the trail, but it’s a lot of work (and elevation change) for not-so-much payoff. Instead, keep going and you’ll come to another branch in the trail. Go left for a mucher betterer view of Hardy. If it’s hot, you’ll want to swim. Is that frowned on? Beats me; I just moved the Pacific Northwest a couple of years ago. I say swim where you want! (but, uh, for legal purposes, I didn’t just say that). Once you’re done skinnydipping (you WERE skinnydipping, right?) and after the cops and the park rangers have released you on your own recognizance, take the other tine of the fork and just keep on keeping right. This will take you on a broad, 7.5 mile loop up and around 2000 feet of elevation gain and through some of the prettiest vista-ing I’ve seen in the Gorge … and peeps? THAT is saying something. There’s a reason why Hamilton is a very popular hike. Coming down isn’t as exciting and you’ll spend some time on an access road, but you get off that soon enough and then you’re in some lovely wildflower and berry areas, if the time of year is right. And hey, if you want, there’s a campground there, too. Camp away, my friend, camp away. The standard: two Black Diamond walking sticks, a liter of water, a couple of ridiculously heavy cameras, a pullover fer if it got cold at elevation (it did not), a compass, a trash bag, a multi-tool, and, of course, a corkscrew (even though this was a flask hike and not a wine-bottle hike). Also: Two apples (one was a Fuji; the other was a Braeburn. The Braeburn is waaay better–not as good as a Honey Crisp, of course, but there is no better apple on the planet than the Honey Crisp (discuss in the comments section)); a trail bar of some sort that I swiped from our houseguests; and my handy-dandy hiking flask (which is a regular, non-hiking flask that I CALL a hiking flask), filled for this trip with Captain Morgan Island Spice–not because I thought that CMIS was a perfect pairing, but rather because that’s what was left in the liqour cabinet. 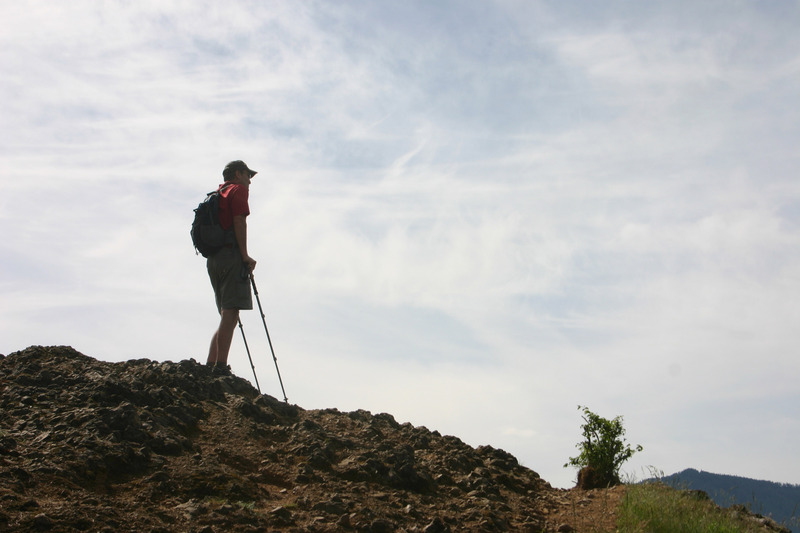 Check below for the wine/liqour/beer – hike pairing recommendations. Wine: There were some hot spots on this hike. If you’re a white wine drinker, which we here at Two Sticks and a Corkscrew are NOT, go with a pinot grigio or a moscato. For reds, something soft and mellow — a merlot would do nicely. 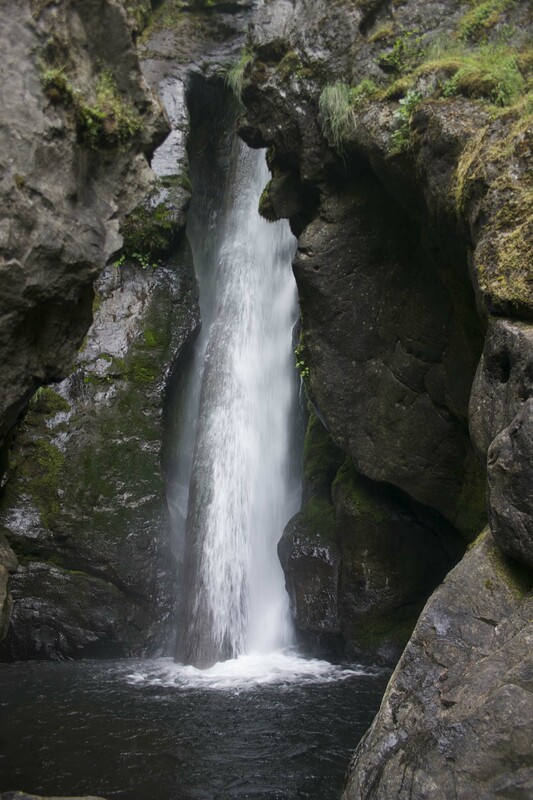 Beer: It’s the Gorge, so if you can stomach it, go with PBR. We finished up this hike at Walking Man Brewery in nearby Stevenson, however, and had their signature IPA. If you forced me to take a beer on the trail, I’d go with a wheat or Corona. But then I’ll almost always go with a wheat or Corona. With, uh, a lime. And, yeah, I’ll take a fancy little paper umbrella too, if you’ve got it. I’m not proud. Hard Liqour: This was a one-flask hike (7.5 miles, after all) and we made do with the aforementioned Captain Morgan Island Spice. I’d recommend, however — you know what? It was a hot day and we didn’t catch the Gorge wind until we hit the ridge on the east side, so I’m going to say go with the CMIS. Has that Jamaican beat to it. 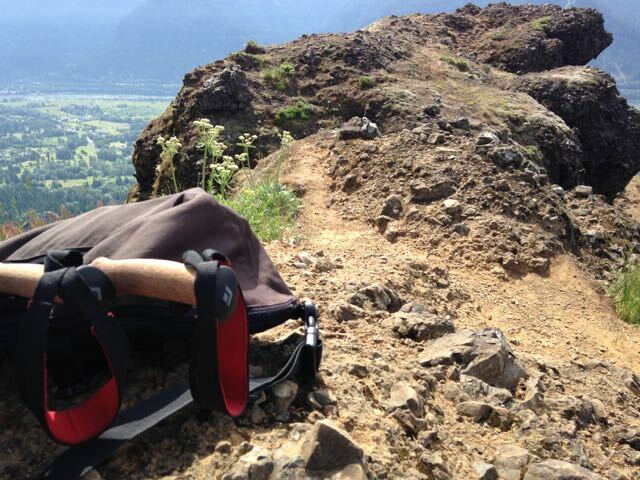 The Gear Bag enjoying the view — and enjoying not being on my sweaty back. Image | This entry was posted in Themed Threads, Two Sticks and a Corkscrew and tagged Columbia River Gorge, hiking, vista, waterfall. Bookmark the permalink.